Blue is a big name in sound products, especially microphones. Now they do headphones, and have been for a couple years now. Their first model was a game changer in the Blue Mo-Fi headphones. Now their updated model is the Blue Sadie. It has the features that are liked, only updated. For song selection, we thought we would mix some new school with some old school. We'll start with twenty One Pilots: Heathens, then go to Kansas: Carry On Wayward Son, and Fresh Aire: Going To Another Place. Twenty One Pilots: Heathens, vocals were very smooth, natural sounding, with very good texture and resolution. Piano sounded very natural with good harmonics. Percussion was extremely crisp and very dynamic. Bass was extremely full, very deep, tight, and played with tons of authority. Kansas: Carry On Wayward Son, vocals were smooth as honey with very good harmonics and texture. Kick drum had very good extension, impact, and played with a lot of authority. Keyboard had very good resolution and was not bright. Cymbals were crisp and dynamic. Soundstage was quite large and imaging was very good. Fresh Aire: Going To Another Place, strings were extremely crisp and clean with very good resolution and dynamics. Piano was very natural with very good tone. Flute was very smooth with tons of air and resolution, easily being able to make out the tonguing technique. Drums had very nice low end extension with a very full sound that was tight and played with lots of authority. I liked the large soundstage with excellent imaging. Blue's Sadie had a very neutral overall sound as well. The MSRP is $399, which is quite a bargain! Their new from scratch design with a very unique headband with multiple pivots gave a perfect fit every time! It also has a built-in headphone amp that while giving a slight improvement to the sound, it mostly gave a big boost to the volume. And it also has a bass boost setting that worked well. The bass boost did only work with the built-in amp engaged. Kudos to Blue for another excellent product! 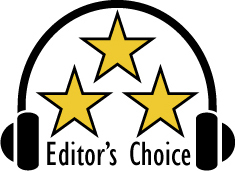 based on their design, features, quality, and performance the Blue Sadie has earned our Editor's Choice Award. For more info and complete specs, check out their website at www.bluemic.com.